The car battery plays a vital role in running electrical components in the car. You need it to start the car, operate the air conditioner, listen to music, wash your windscreen and power up the headlights at night. When your battery is low in voltage, you will start experiencing problems starting it in the morning or the headlights become extremely dim at night. The typical lifespan of a battery is 4 to 5 years depending on usage. However, you do need to test your car battery regularly to ensure it is working well. The voltmeter is the device used to measure voltage in devices. Voltmeters can either be analog or digital; choosing one will depend on your personal preferences and budget. The first thing you need to do when using the voltmeter is to switch off any car accessory that could be draining power from the battery. This will include switching off the ignition, car stereo and headlights. Next, remove the covers on the battery terminals. Connect the voltmeter +ve point to the battery red terminal while the –ve point should be attached to the black battery terminal. Check the readings; a good battery should display a voltage of between 12.4v to 12.7v. A reading of above 12.5v is an indication of a good battery while a charge of 12.3v means your battery is at 75% charge. Anything lower than 11.8v means your battery is low on charge and is operating at 25%. If you do not have a voltmeter then you can check how the car’s headlights respond when you rev the car. If you turn on the headlights and notice that there are dimmer than usual then your car’s battery could be low. If you rev the car and the lights brighten it means that your alternator is working but it is not supplying enough power to fully recharge the battery. If you notice no change in the brightness of the headlights as you rev it then your battery is working fine. This is a new component added to modern cars. The indicator is a cover that is installed on the battery and whenever you turn on the ignition an arrow will move to either red or green. If your battery is low on voltage, it will turn red while if it is in good condition it turns green. When your battery is dead and is no longer in use you will see a black color. You will need a true carbon pile load for this test. Test your battery at a CCA rating of one and a half and watch whether the battery will maintain 9.6 volts at 15 seconds. When performing the test ensure that the battery is at full charge. If you do not have a voltmeter you can use a power prove to check a car battery. The power probe has a tip which you tap on the positive battery terminal and the negative terminal to the –ve of the power probe. A good battery should have a reading of between 12.2 to 12.9 volts. Ensure that you have turned off the ignition and any accessories that use the battery are turned off. The ammeter is used to check the charge going in and out of the battery. Through the ammeter, you will know whether your battery is being fully charged by the alternator. If the charge going in is full then your battery is okay. The hydrometer is used to check the level of acidity inside the battery plates. If the acid is weak then the battery is working fine. For the best results purchase a hydrometer with a thermometer. You will find some models that are self-adjusting while some come with a conversion table. Battery acid is dangerous and you need to wear a pair of gloves when working with acid. Also, do not use a metal thermometer for the electrolyte temperature due to reactions with the acid. To start open the plate caps on the battery top. Drop your hydrometer into the first cell and squeeze the hydrometer top. Once you release the top the electrolyte will flow into the hydrometer. Make a mental note of the electrolyte specific gravity reading. Repeat the test on the other cells. A working battery will reveal a reading of between 1.265 and 1.299 while a reading below this indicates an undercharged battery. Larger discrepancies in readings are an indication of the battery being sulfated. Physical examination of the car battery is essential to reveal any cracks. You will need to disconnect the battery terminals first and then remove the battery from the car. Place the battery on a flat surface and check for any bulge on the battery surface. 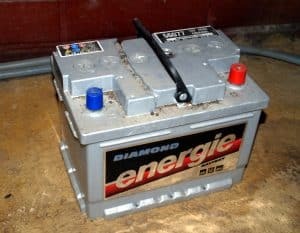 A bulging battery is as a result of overcharging. Next, examine the battery terminals and look at the insulation. If the battery has cracks then you will need to replace it. Before replacing the battery to the battery tray you will need to clean it. Cleaning the battery is simple. All you will need is some baking soda, water, and a soft brush. Pour the ingredients into a container and wash the top and side of the battery with the soft brush. Wipe off excess liquid with a dry cloth. Repeat the procedure with the terminals. Check the battery tray for any signs of corrosion and ensure that there are no mixing screws. Place the cleaned battery on the tray and screw it. Ensure that the battery is not rocking sideways. Replace the terminals starting with the positive terminals. Before closing the bonnet apply some Vaseline or grease on the terminals to prevent corrosion. It is important to check your battery voltage occasionally. 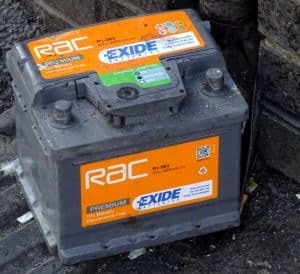 A dead battery can cause you to be stranded in dangerous places. You can begin by checking the battery for cracks or bulging sides. If all is fine use a voltmeter to check the battery voltage. A good battery should have to be 12.5v. If you see a reading of less 11.8v then the battery is low and needs recharge or replacement.